The use of a copper solid amalgam electrode (CuSAE) for the analytical determination of triazine herbicides (atrazine and ametryne) instead of the conventional hanging mercury drop electrode (HMDE) is reported. The results obtained using electroanalytical methods utilizing each of these electrodes were also compared with those provided by the HPLC technique. The results indicated that the CuSAE electrode can be used to detect the herbicides studied, since the detection limits reached using the electrode (3.06 μg L−1 and 3.78 μg L−1 for atrazine and ametryne, respectively) are lower than the maximum values permitted by CONAMA (Brazilian National Council for the Environment) for wastewaters (50 μg L−1) and by the US EPA (Environmental Protection Agency of the United States) in natural water samples (10.00 μg L−1). 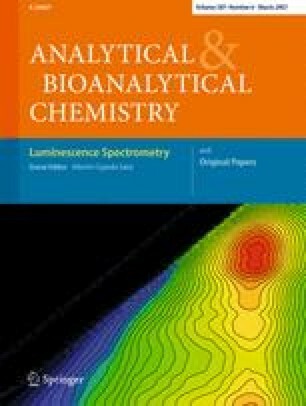 An electroanalytical methodology employing CuSAE and square wave voltammetry (SWV) was successfully applied to the determination of atrazine and ametryne in natural water samples, yielding good recoveries (70.30%–79.40%). This indicates that the CuSAE provides a convenient substitute for the HMDE, particularly since the CuSAE minimizes the toxic waste residues produced by the use of mercury in HDME-based analyses. The authors wish to thank the CNPq, CAPES and FAPESP (process 03/12926-3, 05/00294-8 and 06/50692-2) for their financial support.